In our consideration of lumber exports we assume that the lumber cannot be used to increase local health because all associated final outputs are at their target quantities. In the real world, this is not necessarily the case. For example, we could have been compelled to export the lumber prematurely because of political, commercial, or other pressures. Many poor countries are forced by coercive trade relations to export food crops well before their citizens have consumed the target quantities of these final outputs. Exporting under such conditions can significantly decrease the local region's well-being. The Tanzanians themselves get little in return except meager wages and fish bones. It is clear that the commercial relations driving this export are deeply exploitative, and therefore ignore the health benefits that the Tanzanians could gain from consuming some of the fish themselves. In cases such as this, the sacrifices associated with the export must be reconsidered. These no longer include just the input cost incurred in local production, but also the gains that have been forgone by not consuming the output locally. Both of these components are shown in the following figure. If the local region exports an output that is being consumed at less than its target quantity, it sacrifices not only the input cost from production, but also the gains from forgone consumption. "EV" and "IC" indicate effectual value and input cost respectively. The input cost incurred in producing the export, including the cost associated with its transportation to the remote region, is represented by the line marked ICX. At any quantity, such as Q, the local loss from this production is the area under the ICX line. 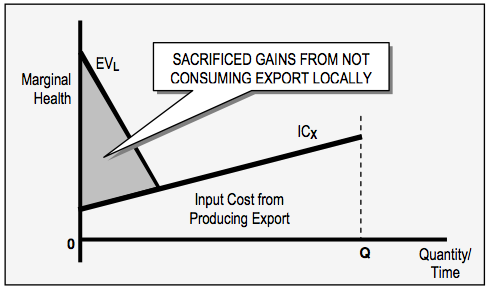 Input cost always accompanies the production of an export. The additional loss now being considered is depicted by the triangle at the top. The gain that could have been achieved from local consumption is the difference between local effectual value (EVL) and local input cost. The net gains from such trade are the effectual value of the import minus this total export loss. If this math were done for the Nile perch and a rational decision made, it is likely that much of the fish would remain in Tanzania for local consumption rather than the entire harvest being flown to Paris and Berlin for the dining pleasures of the affluent. This consideration also applies to intermediate outputs like lumber. ENL's treatment of this subject assumes that all outputs using lumber are at their target quantities. If this is not true — if lumber is being exported when it could be used to increase local health — then this sacrificed health gain must be included in the net gains calculation and factored into allocation decisions. 2. Adam Hochschild, King Leopold's Ghost: A Story of Greed, Terror, and Heroism in Colonial Africa (Boston: Houghton Mifflin Company, 1999), 2. First, "The Congo offers a striking example of the politics of forgetting." (p. 294) Although perhaps 10 million people died there from slavery in the late 19th and early 20th centuries, Hochschild — who had been writing about human rights for years and even visited the Congo in 1961 — had never heard of these Holocaust-like events until he chanced on a comment by Mark Twain. There is no public acknowledgement of these deaths anywhere in Brussels, where the atrocities were orchestrated. When Hochschild reviewed his college lecture notes on Joseph Conrad's Heart of Darkness, which accurately reflects this tragic period, he found prolific comments about "Freudian overtones, mythic echoes, and inward vision" (p. 3), but nothing about the realities of slavery and slaughter. Second, even though Morel was a profoundly ethical person who deserves immense credit for his anti-slavery efforts, even he felt that, "There was nothing wrong with colonialism… if its administration was fair and just." (p. 210) Hochschild found only two contemporaries who understood that Africans were full-fledged human beings who were entitled to their land and resources: African-American historian George Washington Williams and travel writer Mary Kingsley.